Pierate - Pie Reviews: Will they get an Uppercrust on their opponents? Will they get an Uppercrust on their opponents? Despite the uneven crisping of the lid pastry, it was still very flaky and crisp, which is exactly how it should be. The pastry didn’t fall apart while serving, as it had done in previous pies. The chicken and asparagus oozed out of the pastry and was in a delicious white sauce. The capacity had well and truly been reached on this pie, with the chicken pieces lovely and tender and the sauce and asparagus complementing the meat perfectly. I’d certainly recommend getting involved! Worth it’s crust and then some. The big issue that I have with McDougalls pies is that the chicken is sourced from Brazil and Thailand. If you read the fine print on the back of the box, that's where these 'British' pies get their ingredients. Thanks for commenting Brian. 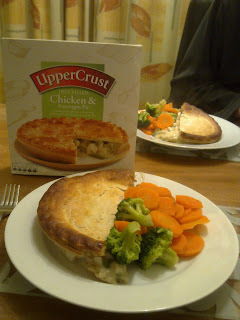 Yes, on the packet it does say the chicken is from Brazil and Thailand (http://www.ocado.com/webshop/product/McDougalls-Upper-Crust-Chicken--Asparagus-Topcrust-Pie/81474011), and I agree with you - this is a shame. I often stay away from those ready-cooked packs of chicken for that reason. Cooked for the required time the asparagus bits in this pie were the texture of wood. I have tried three of these pies as they are quite tasty otherwise but I wont bother with a fourth thank you. PieTunes for the Top 20 over 6! McDonald’s pie review – are you taking the Mc? ASDA Pie Review: Empty promises and empty pies?